We recently got a present of Ferran Adrià’s The Family Meal and we highly recommend it. This is far from the style of food famously served at Ferran’s legendary Spanish restaurant, elBulli. Instead this is a collection of simple and tasty menus that were eaten by the staff at elBulli before service started. The cheeseburger recipe below is part of a menu of Caesar salad, Cheeseburger & potato crisps and Santiago cake. The recipes are all given in quantities for 2, 6, 20 and 75 people so start planning your next party! To make the burgers, tear the bread into pieces and soak in the milk for 5 minutes. Combine the meat, eggs, soaked bread, salt and pepper in a large bowl. Stir together with your hands until the mixture is even. Shape into burgers weighing about 135g each. Cook the burgers with the oil in a frying pan, or under a hot grill, turning once during cooking (we used a barbecue). Cook for 3 minutes for rare, 5 minutes for medium and 8 minutes for well done. Cut the buns in half and toast them lightly in a dry pan or under the grill. 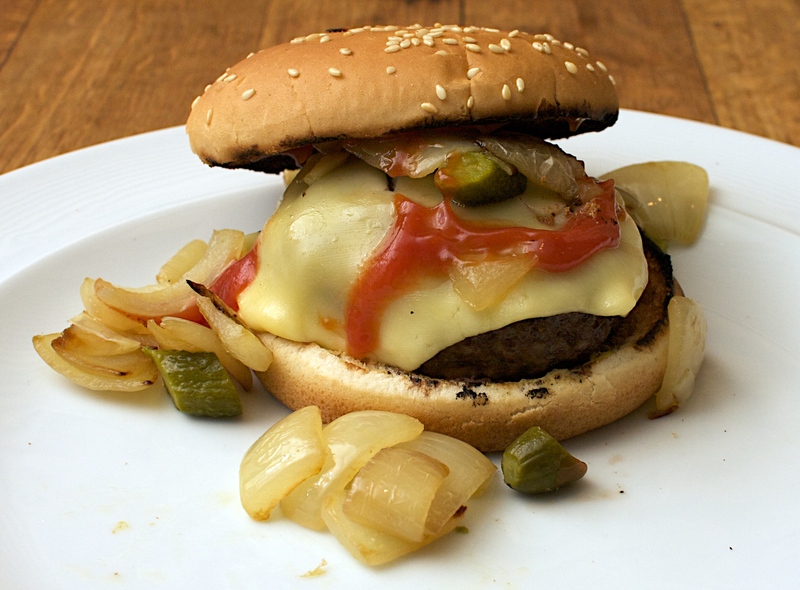 Top each burger with a slice of cheese and life onto a bun. Add ketchup, mayo, mustard, onions, pickles, tomatoes, lettuce or whatever else you like on your burger. Sandwich with the top half of the bun and serve. Ferran suggests serving the cheeseburgers with potato crisps (50g, 150g, 500g or 2kg!). We had oven fries instead which we found a good alternative. Wine Suggestion: A red with nice juicy fruit and a little spice; nothing too subtle or too full-bodied would work well. A medium-bodied Cotes du Rhone red or maybe a beer suits the barbecue theme. What a beautiful photo, it looks delicious!